Review written by and copyright: Rick Curzon (21st June 2018). Beautifully shot in widescreen ShawScope with an at times a vivid, Hammeresque colour palette. Great fun! This one is more in the vein of One-Armed Swordsman (1967) only with added humour and has obviously had much more money spent on it than some other films in the 88 Films range. The master used here these best of the Shaw Brothers films I’ve seen from 88 Films and they’ve done a decent job presenting what they’ve been given. Colours are very rich and the film favours a warm, albeit slightly more naturalistic palette. This coupled with the fact the film is largely shot in broad daylight means the film is mostly bright and sharp. Shawscope was a patented anamorphic widescreen process and you’ll notice distortion at the extreme left and right of the 2.35:1 frame; mainly in wide angle shots. This is due to the lens used during production and is typical of anamorphic widescreen formats (see the 35mm Panavision John Carpenter films). 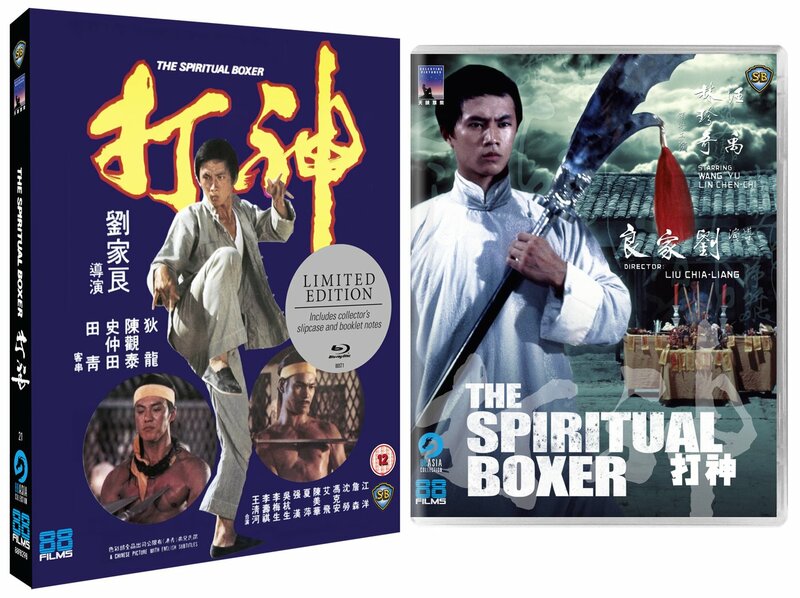 As we’ve seen with 88 Films’ releases of Shaw Brothers films the basic transfer here is very good with very little damage in evidence and a nice stable image. I have found that with many transfers from the far east they favour rather grey black values and as a result if I want to create deeper blacks I just tick the brightness down a notch or two on my TV. Like their recent Black Magic (Part 2) release, this transfer is an an improvement as the blacks are deeper and richer than other Celestial masters. I noticed no black crush at all, bravo. I watched from a distance of approximately ten feet on 58” 4K LCD TV and found this sharp with well delineated detail. The waxiness and lack of fine detail become that was obvious on other Shaw titles is largely absent and grain is present albeit very fine. If any digital manipulation has been used, then it’s been judiciously done. 88 Films have given this a high bitrate, a good encode. As with West’s commentary track on 88 Films’ recent Blu-ray of The Dragon Missile (1976) this a nice mix of the light and the academic with all sorta of trivia discussed about the making of this film. This is easily the best looking of the 88 Asia Collection releases that I’ve seen; I’ve heard it’s culled from a more recent transfer with the film looking and sounding splendid. Extras are as limited as usual but with a very agreeable and informative commentary and Waddell’s essay doesn’t disappoint. As always, 88 Films offer good value for money and fans should rush out and buy this.